The benefits of getting press for a startup are numerous, from attracting more customers to enticing investors and more, so it’s no wonder that so many founders strive to engage the media. Unfortunately, countless founders view public relations as an intricate and costly process, as traditional wisdom dictates that a company must advance its reputation by hiring a PR firm and leaving the whole procedure to professionals. Because of this, many entrepreneurs leave their prospects to serendipity and assume that their company will simply go viral. However, the art of public relations is not as enigmatic, or expensive, as you may think. In this post, we’ll show you how to acquire the best publicity for your startup, featuring insights from top PR experts, with the resources already at your disposal. Do you want to launch a company that people will love? The Founder Institute can show you how! Before you announce your launch or major news regarding your startup, you must ensure that your announcement is newsworthy. After all, whatever news is released about your company will affect its future, so announcing anything should not be taken lightly. Take the time to address these points before looking for press. 1. Do you have a finalized product or service? Merely announcing a beta version of your offering may not be enough to attract attention. Take the additional steps to guarantee that your website can handle a potential surge in traffic. Include an “About Us” or “Press Page”, consisting of logos and screenshots in different formats and sizes, team bios and photos, and a concise company description. 2. Do you have a compelling story? Remember, “my company is launching” alone isn’t a hook, so don’t even attempt to advertise this as news by itself. Don’t exaggerate or fabricate news, as most, if not all, professional journalists will conduct research into your story before writing anything about your company. And most importantly, before you seek press, ask yourself, “Will anybody but me, my family, and my friends care?” If the answer is no, then hold off on getting publicity for your startup. The purpose of a media announcement should be to get as many media outlets, blogs, and journalists writing about you. Tech media is ruthless, and a large number of outlets may refuse to write about you if another website has already covered your story. It takes a lot of time and effort to get noticed, so if you only want to generate enough buzz to attract a small number of users for testing and feedback, making a major announcement about your company is not the way to go. Before you reach out to journalists, reporters, and bloggers, you must first build an exhaustive list of media channels that cover the industry your startup is in. Keep in mind that websites that write about startups that are only vaguely similar to yours most likely will not write about your startup. Even if you compile a long list of related blogs, only a handful of them may be interested in what you do. In the Medium article, “How To Get Press for your Startup: The Complete Guide”, Austen Allred outlines two effective methods for generating a list of blogs that write about your industry. Download the Scraper Chrome Extension, which facilitates online research when you need to get data into spreadsheet form quickly. Go to a blog ranking website, like Alltop, to discover the top blogs that may write about you. The Super Chrome Extension enables you to export your findings into a Google Doc that you can refer back to in the future. Scrape the results from the Google News API, using the Google News Downloader, by Customer Dev Labs. With this tool, all you have to do is enter a keyword - like a competitor, a keyword, a problem you’re trying to solve, etc. - and it will produce a pre-formatted .CSV file of all the articles that have been written about that keyword in the past few days. While these two methods can be a bit time consuming, combining them can give you a wealth of information in minutes. Since you should have already conducted extensive research into your industry and other similar products, you should already be close to an expert. But simply being privy to exclusive industry insights isn’t enough to bolster your reputation, so take the the time to write about your thoughts, opinions, and insights on a regular basis. Once you’ve started routinely writing about your industry, heavily promote your writing on social media to build your audience. If you already have a large following by the time you reach out to the media, you will be that much more attractive to writers looking for a good story. In the Kissmetrics article, “A Beginner’s Guide To Public Relations For Tech Startups”, Heather Anne Carson posits that founders should think of PR as less about making contacts and more about making friends. Having one friend in the media is more valuable than having multiple contacts in the media, as that one person will be the most likely to promote your company than numerous individuals with whom you are barely acquainted. From your media research, identify the bloggers, reporters, and journalists who cover the topics that are most closely related to your company. Engage with these individuals on social media by replying to their posts, retweeting their tweets, and commenting on their articles to get their attention. Send them a warm introduction email that explains what you do, what your company offers, and how you can be a potential source of story material for them. One easy way to do this is to use Hootsuite, a tool that you can use for free to track the news and reporters talking about your space, while also interacting with them and building relationships. For example, below you’ll see the Hootsuite Dashboard that we use at the Founder Institute. We’ve created a stream for journalists we have relationships with, or that we want to build relationships with (“Influencer List”). We can then see what they're writing, retweet them when appropriate, provide commentary, and email them help if I can provide it. (Note: To create a stream like this you first need to create a Twitter list, but after the initial setup you can then easily add new people to the stream within Hootsuite). We are also tracking the chatter around startup accelerators, incubators, demo days, etc to keep a pulse on the startup industry. When trends arise we try to capitalize on them, and we will often add new writers we see writing about the space in this stream to our journalist stream. This is an easy, free way to lay the groundwork for future press. Negotiate. Give the reporter something useful or unique to get them interested in covering you and/or your company. For example, offer them exclusive insights, provide embargo details, etc. Just do it. Don’t ask to send press release / story, just do it. You want someone to cover your story as soon as possible, right? Don’t waste time by asking for their permission. Also, because writers are busy, dragging out your correspondence with them will only increase the chances of your story falling through the cracks. Be genuine. Remember that bit earlier about making friends in the media as opposed to making contacts? Adding personality to your correspondence with media influencers is a good way to get on their good side. Don’t send them generic, cookie cutter emails, and be sure include images, video, and other useful media to your messages to make their jobs easier. Be newsworthy. Don’t abuse your relationship with media influencers by asking them to simply cover your company. Give them a reason to write about you, make them want to compose a story about. And what makes a good story? Don’t be afraid to be a little outrageous when seeking publicity for your startup. Be sure to only promote the most compelling and provocative aspects of your company and its story, as this is what will create the most buzz in the media and will attract the most audiences. A good way to capture the attention of specific journalist is to create a beta version of your site and give them invite codes to your site or an special demo of your offering. This will add an air of exclusivity to your story pitch. 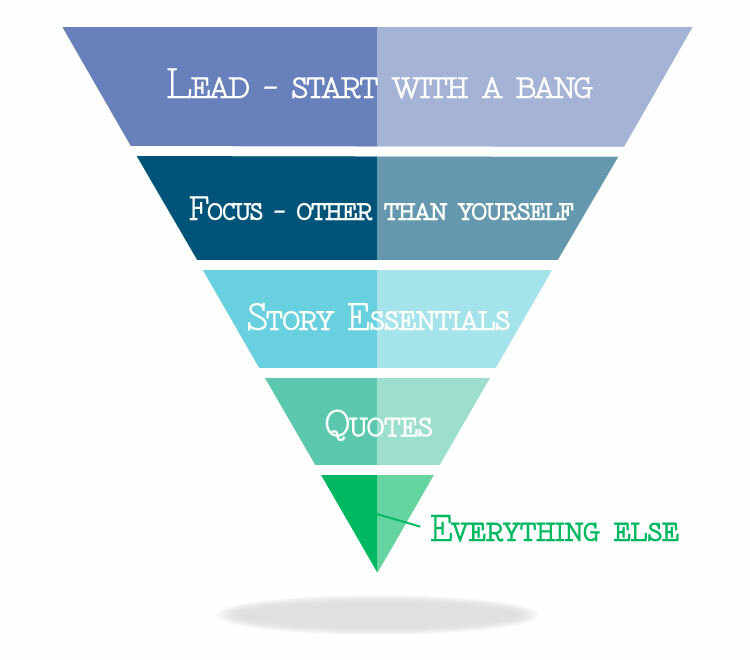 And remember, each scoop of your news should be tailored to the individuals you send it to. Philip Kaplan will participate in our webinar, “How to Get Free Press”, on Tuesday, February 23. Register today! Notify your media contacts at least six days before your story goes live to the public. If you plan on implementing an embargo, be sure that your story isn’t announced prior to the deadline, or you risk someone breaking the news embargo and releasing your story early. Time your emails carefully, as they should be sent during business hours to the target news sources, preferably Monday through Thursday between 8 AM and 3:30 PM. If you send your emails during off hours, your story will probably just be buried in the mess that is a typical writer’s email. Follow up with a polite email in about 48 hours if you don't hear back. Writers are very busy, so adhere to tech media propriety and don’t send an angry email if you don’t hear back, as this is the perfect way to damage valuable relationships with major media channels while tarnishing your own reputation. A strong launch or news release should generate a massive amount of interest over a period of twelve hours that will taper off over the next three days or so. With a successful release, expect to retain about 20% of initial interest. Manage the release timeline by ensuring that all of the necessary people have been contacted and that all relevant details have been released. Keep your schedule flexible to help any journalist write additional stories by following up immediately with any inquiries. Capitalize on your success by responding to all points and questions in article commentary and through social media. Expect considerable traffic to your website during this time, so make sure it is operating at peak performance and that you are able to quickly fix issues. Encourage your friends, family, customers, colleagues, and anyone else in your network to spread the word on social media. Customized/personal introduction: Compose an introduction that’s unique to the person you’re contacting. Condensed hook: Think of this as the “tweet” version of your story. Offer something unique: Provide an exclusive story, an in-person interview, industry insight, etc. The hook is a catchy, 1-3 sentence, concise version of your story. This is arguably the most important part of your press release, so don’t mess it up! This can be additional, yet less interesting, achievements or qualities of your company. These should be listed in descending order of importance. This section usually consists of general background of your company and its founders. Inlcuding logo images, screenshots, graphs, charts, videos, and additional data makes the writer's job easier to craft a compelling story about your startup, and also legitimizes your company. If a publication did not cover your launch or news, don’t take it personally, but instead keep them engaged and follow up again when you can validate the story with something else newsworthy (interesting data point, feature release, partnership announcement, etc). Capitalize on your momentum by establishing yourself as a thought leader, or your company as a pioneer, and release some interesting stats validating your message. Speak at events, if possible, and always keep press in mind as your company grows and advances. If you want to attract more mainstream publications, keep in mind that they need a more human side of a story rather than just the technical aspect. Constantly think about the hardships you and your company experienced to succeed, and how they can be turned into compelling stories and anecdotes. If you ever call a reporter, after introducing yourself your first question needs to be "are you on deadline?" 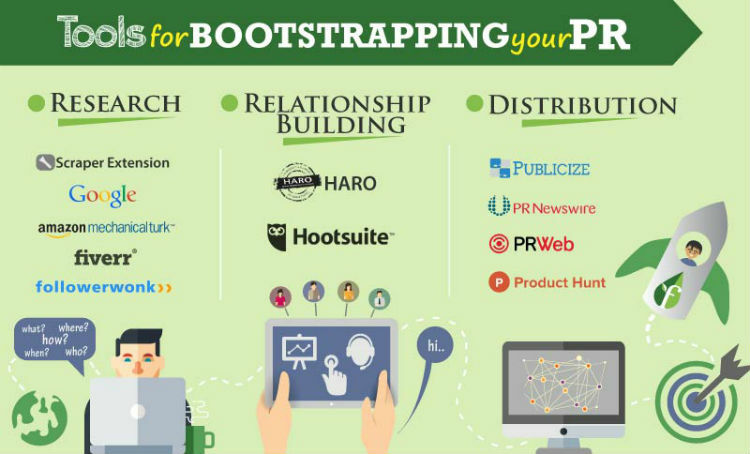 Now that you have your PR strategy finalized, check out the infographic below for a list of tools to help you get your started. Keep in mind that establishing your company’s reputation and securing its publicity requires time, effort, and experimentation. And in the realm of entrepreneurship, nothing is more delicate than a startup’s notoriety, so public relations should not be taken lightly. However, now that you have the means to build your company’s stature in the startup world, you have no excuse not to make a great name for yourself. So get out there and advertise! The Founder Institute has helped thousands of companies with their PR strategies. Join a chapter and learn how to launch a company that people love!